I've searched for the answer to this question, regarding my specific model year and radio, but could only find answers for other radios and/or years. I have a 2002 Accord LX with a single-disc CD player plus AM/FM radio. The CD button is labelled CD/Tape. 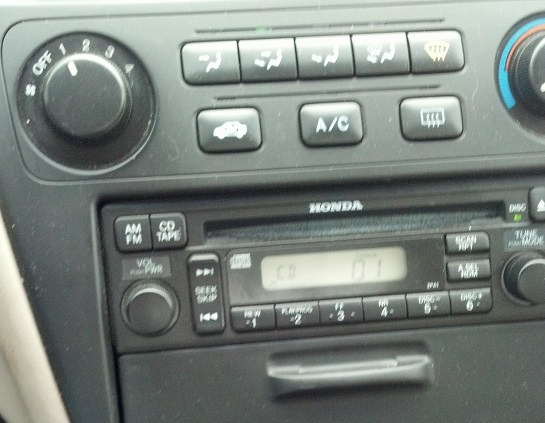 There is a spot under the radio where a tape player might go. The space currently contains a storage box. I'm thinking there might be an input for a tape player and that I might use this, with an adapter, to install an aux-in plug or jack. Is that possible? Also - I saw something for a different year model that suggests that it's possible but would require permanently removing the storage box in order to access the tape input on the bottom of the radio. Is that the case for my 2002? I dont know the answer to your question. I do know that all 6th gens should have the same radio, so if what you saw was for another 6th gen then it would work on your car. Well, not exactly; I found a site about a year ago that made an AUX-IN for all Gen 6 head units except the CD Changer model which is in my 2001 Accord EX. To mcknigs, I'll see if I can find the site which has the AUX-IN for the 2001 LX models and I'll post later (probably tonight), errr, unless someone else beats me to it. your right, I should have been more clear i guess. all 6th gen 6 discs are the same. all single discs are the same, and if they made a navi unit it should be the same across the years. so if you can find one for a 6th gen single disc then it should work. Thanks for the responses. I'm not sufficiently familiar with Accords to know which generation is which, but I assume that 2002s are 6th generation, yes? So if I can determine which years are included in the 6th generation, and find an adapter for a single disc CD player/radio from one of those years, that should work for me? Does anyone know whether I would need to permanently pull the storage box under the radio to keep the adapter plugged in and have access to it? Gen 6 Accords were produced in the 1998 through 2002 model years. Thanks Shipo, that's very useful. I've continued looking, using search terms that include variants of "sixth generation" and/or the model years, and "single CD" and I still finding that my searches turn up mostly 6-CD changers and/or more recent model years. I did find an adapter that seemed like the correct one and they wanted $129 for it. I wonder whether an alternative would be to find the wiring harness somewhere -- perhaps a junk yard -- and make my own. I would think it would just be a matter of identifying the three (L+, R+ and common) or four (L+, R+, L-, R-) wires carrying the signal and solder them to a 1/4" TRS jack. Then I could plug in a cable with a 1/4" stereo plug on one end and a 1/8" stereo plug on the other. Sounds like a fair amount of work but better than paying $130. that would be a question for keep hope alive. he knows more about how signal processing works and if splicing into another type of connection will provide the correct signal type. but if all you can find is a part for that much, my suggestion would be to buy an aftermarket headunit.